Oh, Amazon Prime you know me so well. [*switches off the smart speaker in a paranoid panic* - Ed]. No, seriously, I had decided to watch a film, pretty much any film, because it was cold and rainy outside and top of the “recommended on Amazon Prime” list was a 2010 film I’d never even heard of. A film starring Martin Sheen. Directed by Emilio Estevez. So of course I watched it. 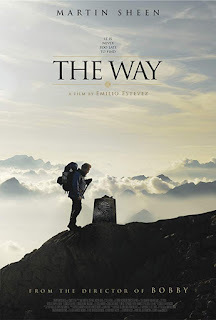 The Way is a road movie with a difference. Martin Sheen plays Tom, a widowed Californian ophthalmologist whose son, Daniel, yes played by Estevez but not in the way you think, dropped out of education and decided to “go see the world” much to his father’s annoyance. Like all good doctors, Tom is on the golf course when he gets a call from a French police captain, saying that Daniel has been killed on a trek in the Pyrenees and could Tom come to take his son back home. 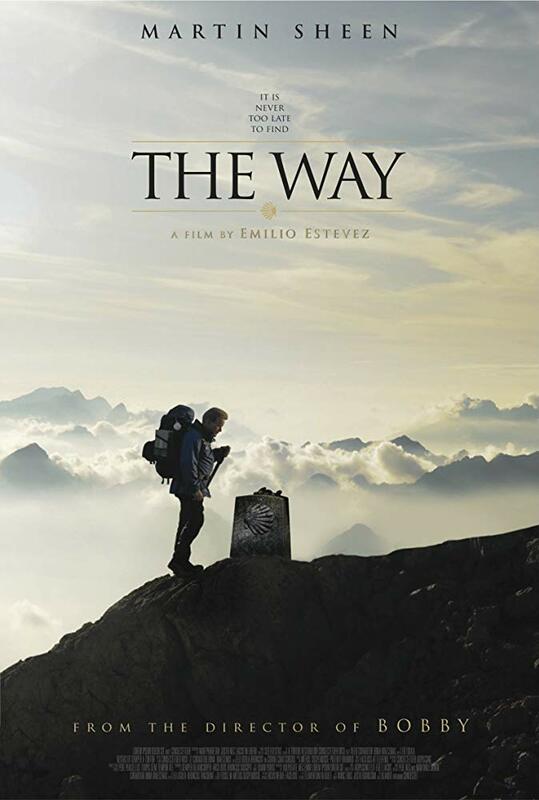 Tom travels to France, meets the police captain and discovers that his son was on the first day of walking a famous pilgrimage, The Camino de Santiago (The Way of St James) when he got caught in a storm and was killed. Overnight, Tom decides to have Daniel’s body cremated there in France and he would complete the pilgrimage that Daniel started, using Daniel’s backpack and taking the ashes with him, all 800 km of it to the cathedral of Santiago de Compostela in Galicia in northwestern Spain, where tradition has it that the remains of St James are buried. Along the way he meets fellow pilgrims, each with a reason for walking The Way. First there’s “Joost from Amsterdam” (Yorick van Wageningen) who was walking to lose weight for his brother’s third wedding, because he didn’t want to have to buy a new suit, but enjoying the food and the wine of the region too much. Joost tags along with Tom, even though Tom doesn’t want the company, as one of these chattery friendly types and, even though Tom keeps trying to get away from him at the start, their paths always cross until they end up walking together. At a hostel Tom meets Sarah (Deborah Kara Unger), a Canadian with a bitter attitude and an addiction to smoking, which she vows to give up once she reaches the feet of St James. They cross paths again further down the way and Sarah tags along with Joost, again annoying Tom. The last of their merry band of misfits, Jack (James Nesbitt – yes, I know, a lovely surprise) joins the group when he loses grip of the stick he was hitting his backpack with in a fit of anger and it nearly hits them. Jack is a writer who is walking The Way partly because he is a travel writer but also because he has writer’s block and needs to break it. As with all good road movies, things happen along the way, other people come and go, there are comedic events and tragic ones and, every now and then, just a glimpse of the orange-kagoule-clad Daniel on the road with his father as Tom learns that there is more to living than work and golf. This was a great film. I don’t mean that this was a ground-breaking film, because it was never meant to be, but it was the film that I needed it to be on a wet and stormy night - it was comforting. The scenery was stunning and the cast and acting were, as you would expect, brilliant. Sheen encapsulated the single-mindedness of a grieving father, determined to make up for everything that he hadn’t said to his son, and the gentle kindness of Wageningen as Joost made the perfect foil for his gruffness. Nesbitt was perfect as the over-exuberant “James Joyce wannabe” Irish writer, as quick to forgive as he was to fight and Unger’s character of Sarah grew into a much more complex person than first thought. Something that I was really pleased, and quite surprised, about too was the fact that the story did not try to shoe-horn in any romantic interest for any of them. This was just four people, each with their own reasons, walking a pilgrimage together. It did exactly what I hoped it would do with the plotline and that left me at the end with a satisfied smile rather than disappointment or feeling like I wanted more from it because, sometimes, you don’t need to be challenged by a film, just left to enjoy it for what it is.